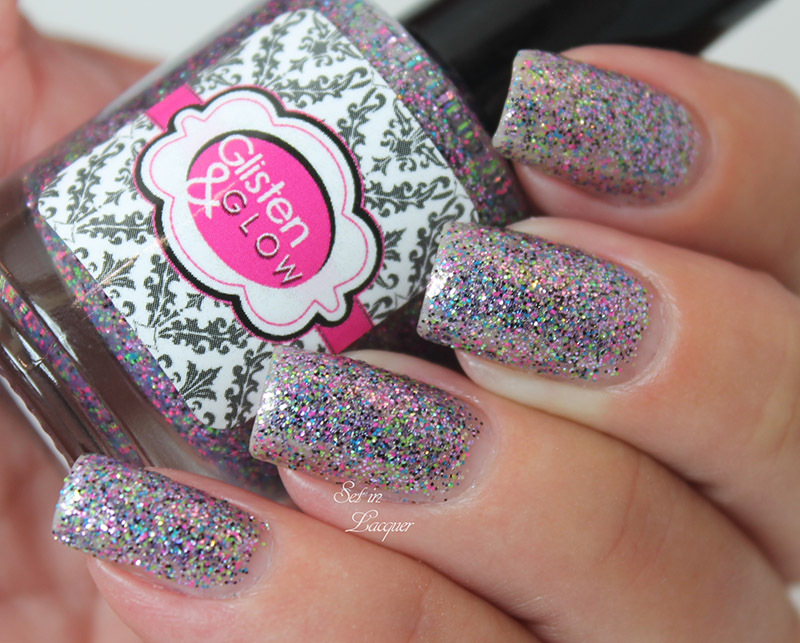 I have a fun, slightly textured, micro-glitter polish collection for you today - Studio 54, by Glisten & Glow. The great aspect of these polishes is the versatility. They can be worn on their own as a slightly textured polish, with top coat to completely even them out and provide a glossy finish, or over a base color. They applied easily and the glitter covers evenly and rests flat against the nail. Let's take a look at these glittery sensations. 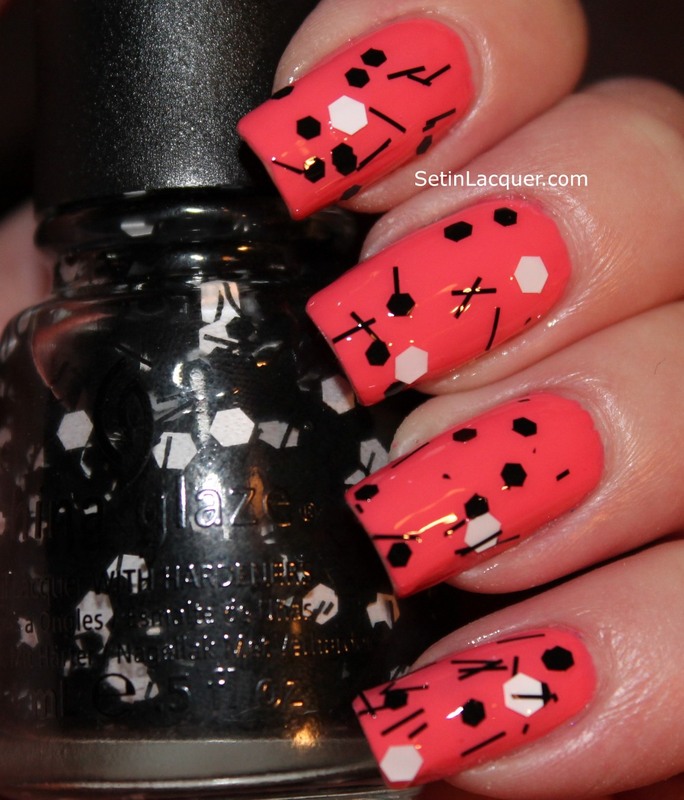 I used three coats for each swatch and I had no issues with application on any of them. Dancing on Star Dust is the most unique mixture of the collection. It contains a perfect balance of lavender, pink, green, blue, black, and gold micro-glitters in a slightly violet tinted base. No one color dominates the mixture, making this one standout from the others in this collection. It's confetti on your nails. At the Door @ 54 is jam packed with magenta micro-glitters. It also has pink, gold, blue, and silver micro-glitters in a magenta pink toned base. 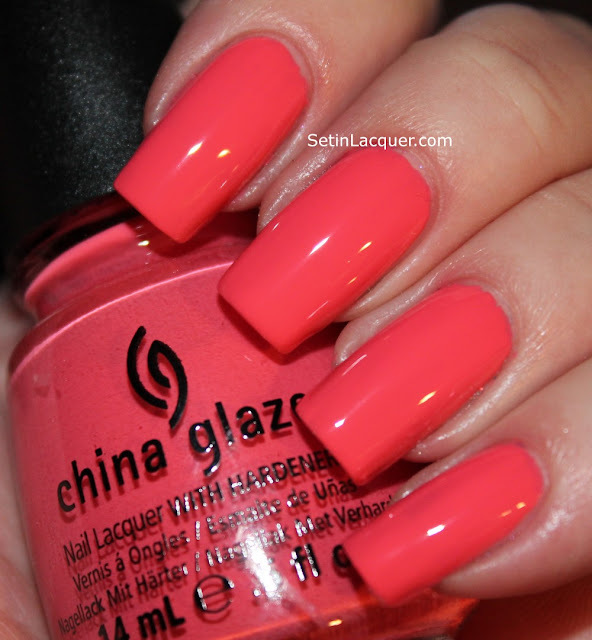 This shade is sure to be an eye-catcher with its bright appearance. The colors complement each other and give it a classy, yet inspired look. Rubell's Bus Boys has primarily red-toned coral and orange micro-glitters in a similarly tinted base. It also has a beautiful balance of blue, gold, and silver micro-glitters as well. It isn't quite as red as my photos show. The red-toned glitters seem to jump out when I am taking the photo and photo-bomb the shot. It does flash red, but appears more salmon in real life. The Moon & The Spoon is my favorite of the collection. It has mostly blue micro-glitters, along with gold, red, green, and silver micro-glitters in a slightly tinted blue base. The contrasting colors in this one provide a unique and very noticeable contrast. The overall look is very pleasing to the eye. 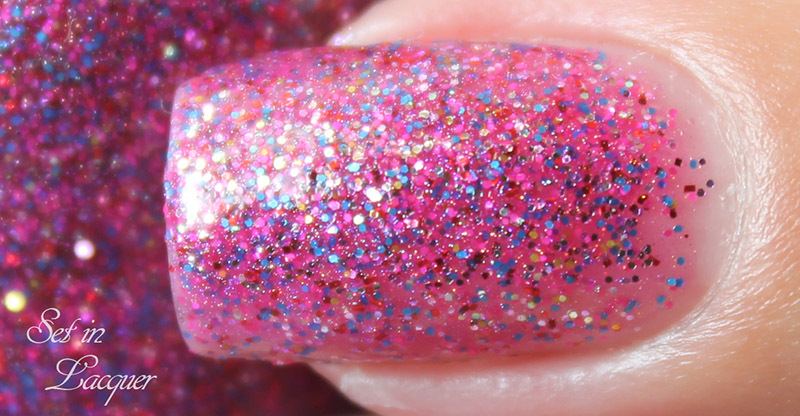 Gettin' Dirty with Disco Sally is packed with bright pink micro-glitters in a clear base. The addition of gold, red, pink, black and fuchsia micro-glitters create the perfect sparkling super girly mix. It's bright and stunning. 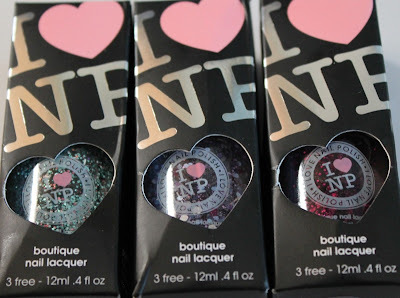 This collection is a dream for texture and glitter loving polish aficionados. But it's also the perfect fit for those that like a smooth and glossy finish. These polishes are available at GlistenandGlow.com for $10.50 each. These products were sent to me for an honest review. All opinions are my own. Please note that computer monitors may reflect colors differently. Rainbow Honey is releasing a new collection just in time for Valentine's Day - the Sweet Talk Collection. The Sweet Talk Collection will be available on Fab.com on January 16th at 11 a.m. EST. The private sale will run through 11 a.m. January 19th. Not a member of Fab? Join before the sale - it's free to sign up! Following the Fab.com sale Sweet Talk Collection will be available again on http://rainbowhoney.com. For this trio, Dee - Rainbow Honey's Chief Designer - chose to create two colors that were wearable on their own - Be Mine and Sweet Talk - yet still fun and shimmery. In addition to these two, XOXO adds that extra dimension and spark when you want it - perfect for an accent nail or as a full manicure for extra sparkle! I received two of the collection to share with you. XOXO and Sweet Talk. They are quite nice. I think Rainbow Honey has improved its formula. It is not as thick as previous polishes I have tried from the brand. The formula is nice. It has a smooth application and a good dry time. 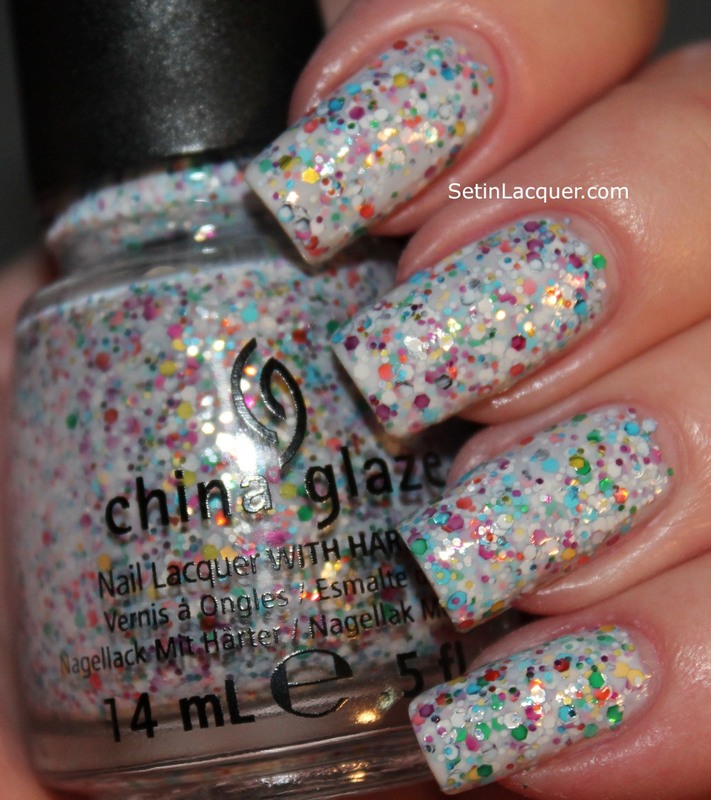 Sweet Talk - is a decadently sweet collection of pastel glitters in a white jelly with hidden shimmer. I really like the multi-color glitter. It reminds me of the candy hearts we traded as children. It can be worn on its own. This is two coats. 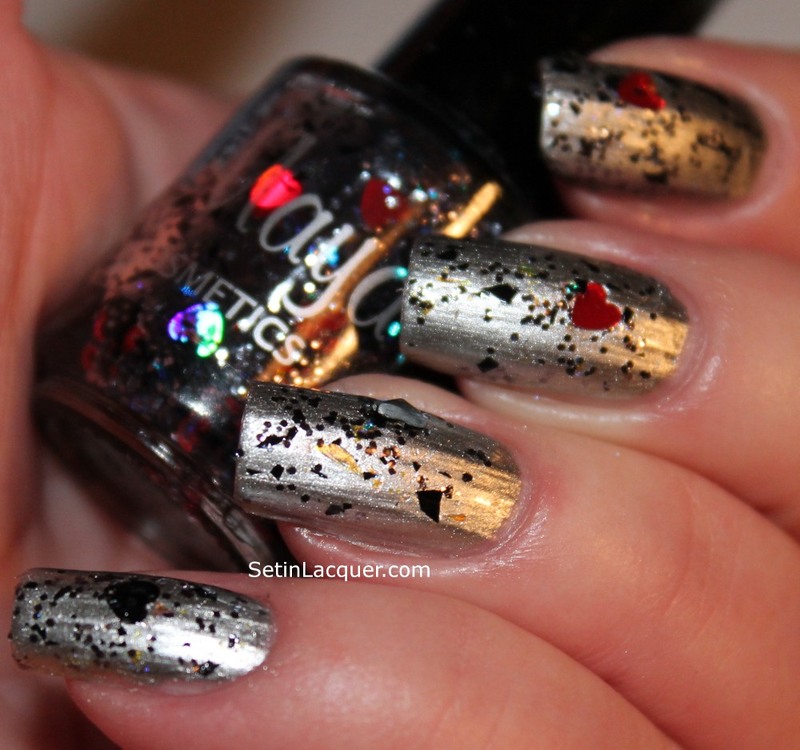 XOXO- is a wonderful blend of glitters and flakes in a clear base for easy use over any manicure. I applied it over Barielle Queen for the Day which is the palest of pastel pinks. Look at that shimmer and shine from the flakes. Keep up with future Rainbow honey collections by following on Facebook. Happy New Year! I hope 2013 brings you a happy family, good health and favorable luck. I received three of the polishes from I Love Nail Polish (ILNP) New Year collection and couldn't wait to share them with you. ILNP are three-free. The ILNP New Year's Collection is available on her Etsy shop for $10 per bottle. Like her previous collections, this one consists of six lovely and versatile polishes that work well alone or over your favorite base colors! The packaging and bottles are adorable. The formula on these polishes is nice. The glitter applies evenly and the dry time is decent. It may take a little longer than some but not enough to deter me. I didn't have to "fish" for glitter. A Nice Chianti - is a burgundy multi-sized glitter. I applied it over Barielle Remember Me. This is one coat of A Nice Chianti. I love the subtle look the polish has here. Little Mermaid - is a multi-color fine glitter. 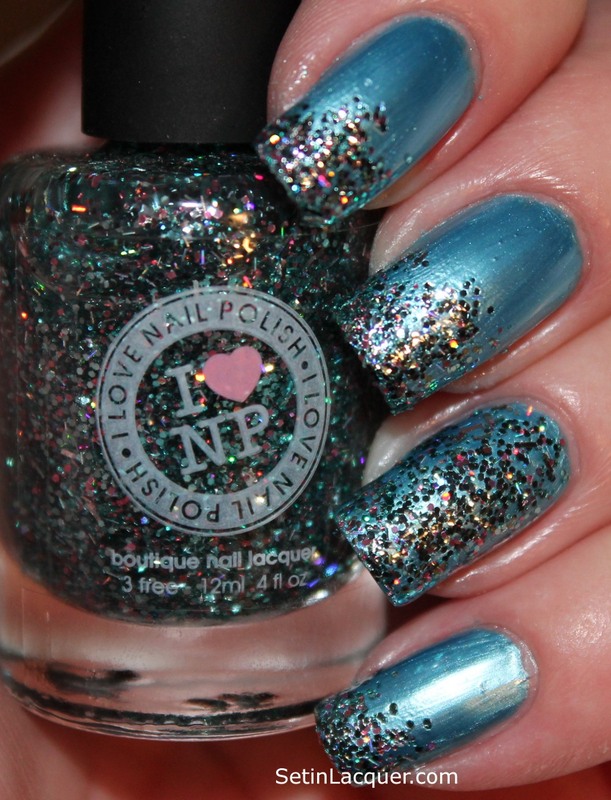 It has primarily blue glitter and just enough of different colors to add depth. I used a cosmetic sponge to apply it to the nail tips. I applied it over Venique Diamond Kisses. Purple Stuff - is my favorite of the bunch! The glitter is different sizes, shapes, and colors. I have it on here over Essie St. Lucia Lilac. I didn't have to "fish" for glitter. I love this combination. After trying these three colors I will definitely try more of her polishes. These polishes are available on her Etsy page for $10 each or $50 for the collection of six. Tis the season! The season for glitter, glam and festive nails. Here is a Christmas Tree manicure complete with garland and ornaments. 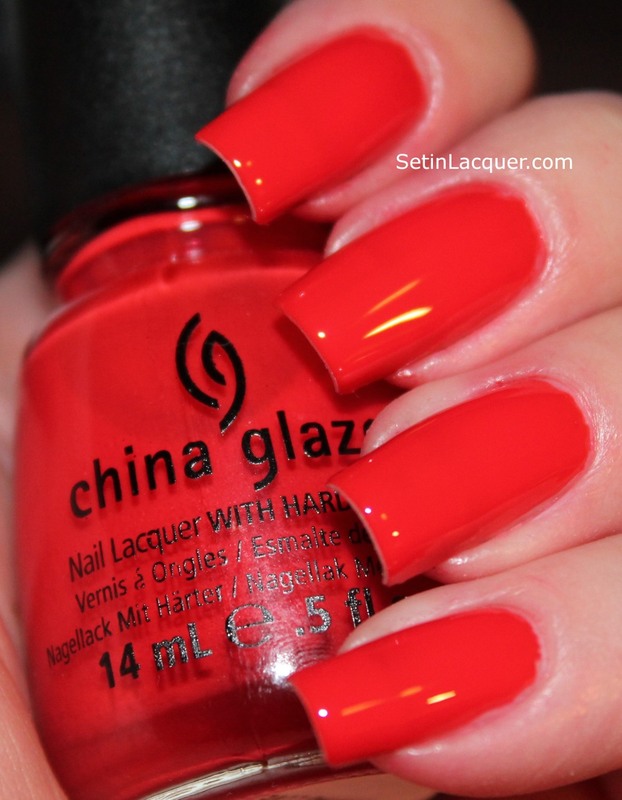 I used China Glaze polishes for this look. I meant to make a step by step guide but I got carried away and forgot to take photos of each step. So I will try and explain it the best I can. I used China Glaze White on White for the base color. Then I used a nail art brush and China Glaze Going in Circles to outline the zigzag outline for the tree. I filled in the outline with Going in Circles. Then I used China Glaze Angel Wings for the garland by painting on diagonal lines. I finished off by making the ornaments with a dotting tool and China Glaze Ruby Pumps. 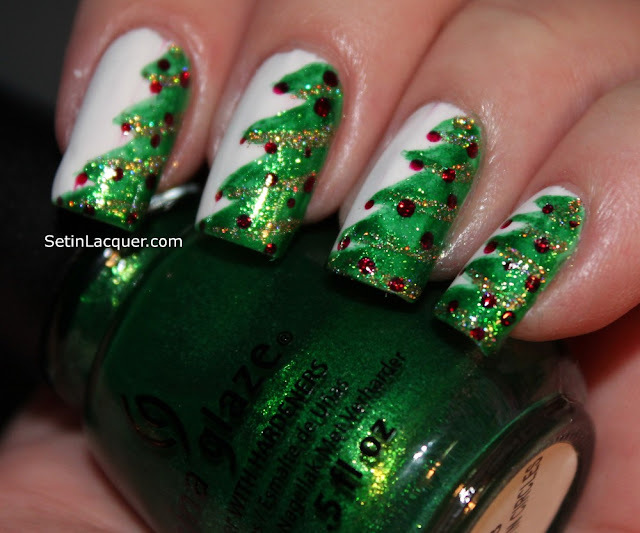 I hope you enjoy these festive holiday nails. I have some exciting polishes to share with you. The China Glaze Cirque Du Soleil Worlds Away Collection. The remaining six polishes in the collection are in this post. This collection surprised me with some amazing creams, shimmers and glitter polishes. See the previous post on the collection here. "Our unique lacquers contain China Clay as a nail hardener, the same material that gives porcelain its shiny finish. These glossy lacquers work in perfect cohesion with our professional nail treatments for lasting strength, durability and overall gorgeous nails," China Glaze website. The formulas varied but were good and the dry times were quick. I will list more details on each swatch. It's a Trap-eze - is a glitterfest. Two coats provided great coverage. Tons of multi colored glitter are jam packed in this polish. You will definitely a top coat or two as it is a pretty thirsty polish. This one looks like an Indie polish. 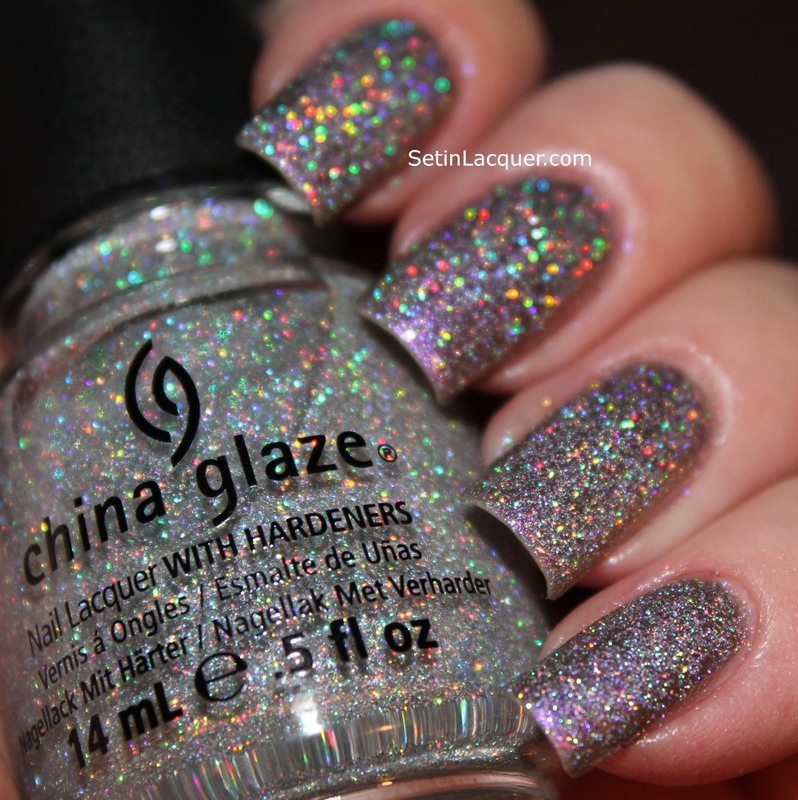 China Glaze has been taking notes it seems. I have never been a glitter type person but if you are - this polish is for you! 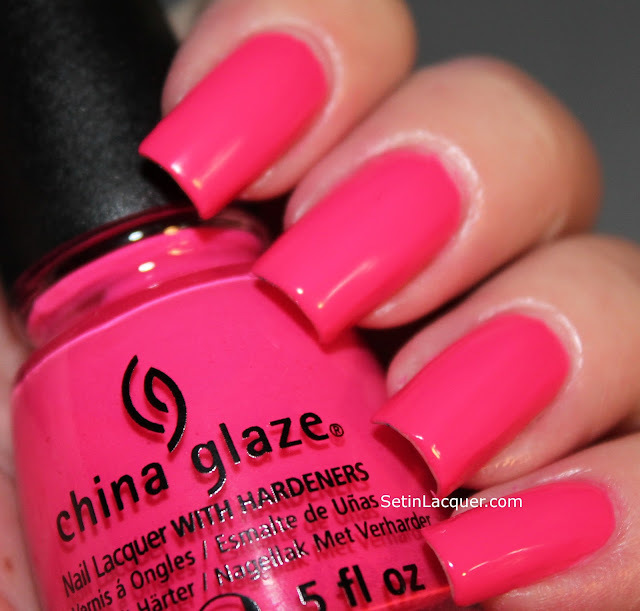 Escaping Reality - is a wonderful "Barbie" pink. Two coats provided opacity and shine. Although this one didn't dry to as much of a high-gloss finish as the others it still has a great shine. Get Carried Away - is a glitter top coat. It has deep red, black and gold hex glitter along with black bar glitter. Make sure to apply it in a thin coat. It is a thick polish and will clump if you try to put it on in a thick layer. Going in Circles - is my favorite of this group. 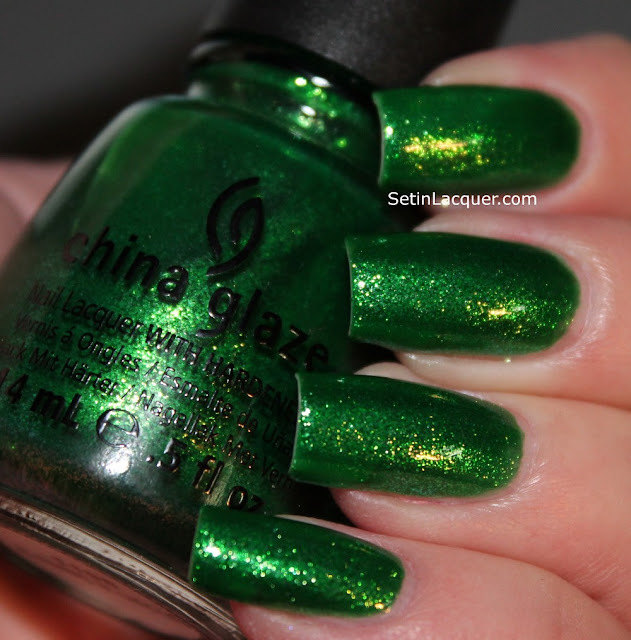 A bold green with a gold shimmer. Two coats provided great opacity and a wonderful shine. I will be excited to use this one in my nail art efforts! Hanging in the Balance - is a wonderful and bright blue. Two coats provides a great opacity and high gloss shine. Make sure you use a good base coat and maybe even two layers of base coat. Blues in general tend to stain the nails. This one is no exception. Water you waiting for - is a great glitter polish. The glitter is dense enough it could be worn on its own. Here I have it on over Hanging in the Balance. The inspiration for this collection - the movie Cirque Du Soleil Worlds Away - is set to be released in the US on December 21, 2012. I have some exciting polishes to share with you. The China Glaze Cirque Du Soleil Worlds Away Collection. I will highlight six of the polishes in this post. This collection surprised me with some amazing creams, shimmers and glitter polishes. Bend Over Backwards - is a luscious, shimmery red. Two coats provided a great opacity and a lustrous shine. I love this shade of red. Creative Fantasy - is a wonderful grape purple. It has an amazing jelly consistency. The only drawback with jelly polishes is that they require several coats to reach opacity. This is four coats. It dries with a rubbery finish. I used a top coat on the pointer and middle nails so you can compare the finish. Def Defying - is a wonderful lime shade. It is a cream polish and dries to a high gloss finish. This is two coats. Igniting Love - is a deep salmon shade. I really enjoyed this cream polish and its glossy finish. This is two coats. Whirled Away - is a matte glitter top coat. Black bar glitter and multi sized black and white hex glitter are abundant in this polish. Although the glitter required some "fishing for glitter" by the time I got to my pinkie nail I had it figured out. Even so it does require some effort to get the glitter on the nail. But once applied I loved the look! Especially over Surreal Appeal. Surreal Appeal - is my favorite of the six posted. A wonderful light salmon color. It is a great cream polish and it dries to an extreme high gloss shine. This is two coats. 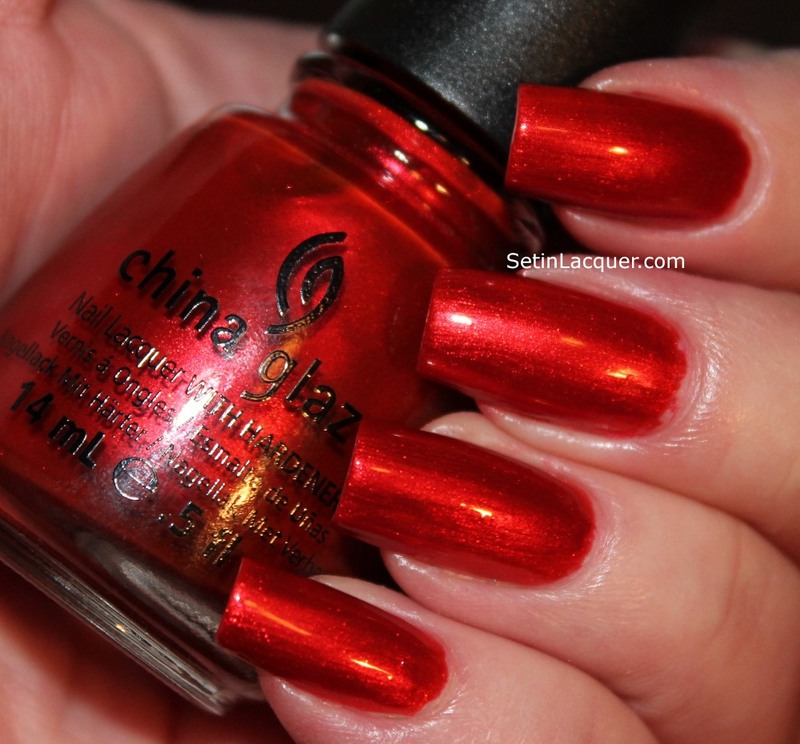 Make sure to watch for the remaining China Glaze China Glaze Cirque Du Soleil Worlds Away polishes in the next post! I hope everyone had a wonderful weekend. My night is going to be jam-packed with watching my favorite show "Once Upon a Time" and laundry. So I just want to share a quick NOTD with you. I used China Glaze Glistening Snow over China Glaze No Plain Jane. What a magnificent combination! No Plain Jane is a wonderful deep, yet almost smoky, purple. Glistening Snow is holographic micro-glitter. The sparkly almost put my camera into spasms though. Glistening Snow was sent to me for review. No Plain Jane was purchased by me. All opinions are my own.